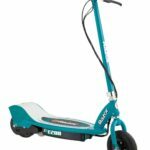 We purchased the Lucky Scooter Prospect Pro Scooter for our 12-year-old grandson at the beginning of the month. It arrived by the following week, which was much quicker than we expected, and it arrived in great condition! We were blown away when we opened the package because it looked really sharp! It was also much easier to assemble than we thought it would be, and very little assembly required. The main thing we had to do was mount the bars. Which was wonderful because we couldn’t wait to put it together and head over to his mom’s house to surprise him with it! He absolutely loved it and was out riding immediately! We bought him the “Halo Green” colored scooter because we thought it was a gorgeous color. Plus, green is his favorite color, so we knew he’d feel super cool while riding it and showing it off to his friends in the neighborhood. The intricate yet youthful artwork on the bottom of the scooter deck is also really awesome, and yet another thing for him to show off to his schoolmates. Nothing wrong with being the cool kid in town, I suppose. His mother tells me he’s often out riding for hours at a time now and takes it with him everywhere he goes. I believe it. Anytime we go for a visit, he’s using it to ride down to a friend’s house or just riding up and down the driveway. We have to practically drag him inside for dinner when we’re over. The soft hand grips reassure me that he’s comfortable while riding. He’s an active boy and always gets sores and calluses on his hands from the bikes and scooters he has had before, but not this one. He said the bars feel nice on his hands. The opportunity for an injury is always a concern when children are involved. Low quality or cheap items tend to break down easily. So, I really want to place emphasis on the fact that this scooter is made from AIRCRAFT-GRADE ALUMINUM. Seriously, the same stuff that is used to build spaceships and airplanes! It definitely eases my worry that he will sustain some sort of injury from a faulty product or that it’ll break from overuse. It’s also incredibly light-weight, which completely blows my mind! Guaranteed durability and the total weight is only 8.3 lbs! A small detail we overlooked while purchasing, but are beyond grateful for now since he’s lugging it around everywhere! If the Lucky Prospect Scooter can survive this kid, I know it can survive anything. The steel brake feature is also reassuring. The locknuts are welded in place, instead of screwed on, which has been the case with other riding equipment in the past. The fact that they are welded on removes any concern that a nut or bolt will become loose while riding. The Atom 110mm pro scooter wheels provide for a super smooth ride on uneven surfaces like the sidewalk or graveled areas. The ability to change the height of the handlebars is a great addition, too since he’s 12 and only stands at about 5’1. 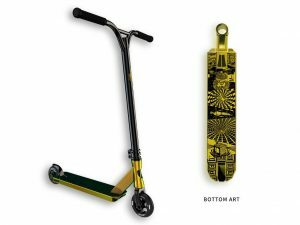 Everything combined, such as the wide deck, oversized and adjustable bars, durable metal design, and reliable brakes, make for the perfect scooter to practice tricks on. He’s getting older now and spends a lot of time and energy learning new stunts at the skate park. He claims the scooter will make him a pro! Considering the top quality product we received, I believe he can do just that! The only cons I could possibly mention would be that this stunt scooter is too good. I think he may well love this scooter more than he does us now! Kidding! I guess I would suggest including a helmet and some knee and elbow pads for free, or at least at a discounted price. 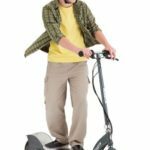 This scooter is suitable for kids, teens, and even adults, which is part of what makes it so great. Taking into account that it was an appropriate gift for my grandson, it would be nice to have some safety gear included. I’m sure other parents and/or grandparents may agree. But in my personal opinion, the product itself doesn’t have any negative aspects to it. This also doesn’t go to say the people who designed the Lucky Scooter Prospect Pro Scooter failed to take safety into account. You can tell the Lucky brand care a lot about their customers just by looking at the processes used to design each individual part that went into developing this particular scooter. The steelybrakes are welded. The Lucky DUB clamp has holes that are drilled extra deep to avoid stripping and include top of the line hardened bolts. The vicegrips come in a variety of colors and are designed for comfort. The ATOM 110mm urethane wheels are also designed for comfort and ease of riding, as well as durability. Overall, I would highly recommend this product to all of my friends and family. The Lucky brand always seems to find innovative ways to create products that are durable, effective, and safe. In the future, I am absolutely going to keep the Lucky brand in mind, because I can tell they do everything they can to develop the best products, with safety being a top priority. You get an incredible, super durable product AND peace of mind for a great price! And if you’re lucky, the person you buy this scooter for will love it almost as much as my grandson does.